Abby the Librarian: 48HBC Tip: What Do You Want to Get Out of It? 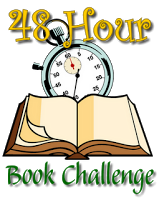 As you know, this year's 48 Hour Book Challenge takes place this weekend (June 7-9) and I'm so excited about it that I decided to share a couple of 48HBC tips this week. You've probably already been thinking about what you want to read this weekend, but it's also worth it to think about what you want to get out of the challenge. For me, it's the community aspect that I love. I could certainly devote a weekend to reading now and then (and I have! ), but it's so much more fun when there's a community of book-lovers reading along with me. I'm also hoping to get a blogging re-charge this weekend. I'm not blogging as much as I used to and, while part of me is definitely okay with slowing down a bit, part of me really misses regularly writing about the books I'm reading. I'm hoping that this challenge will help inspire me to write reviews more often. And I'll definitely come out of this weekend with a stack of reviews to post over the upcoming weeks. What are you hoping to get out of the 48-Hour Book Challenge this year?